©Photo by Margarida Correia. See caption at bottom of this post. New York City local food advocates on Wednesday got a taste of how the city’s mayoral candidates think about food. 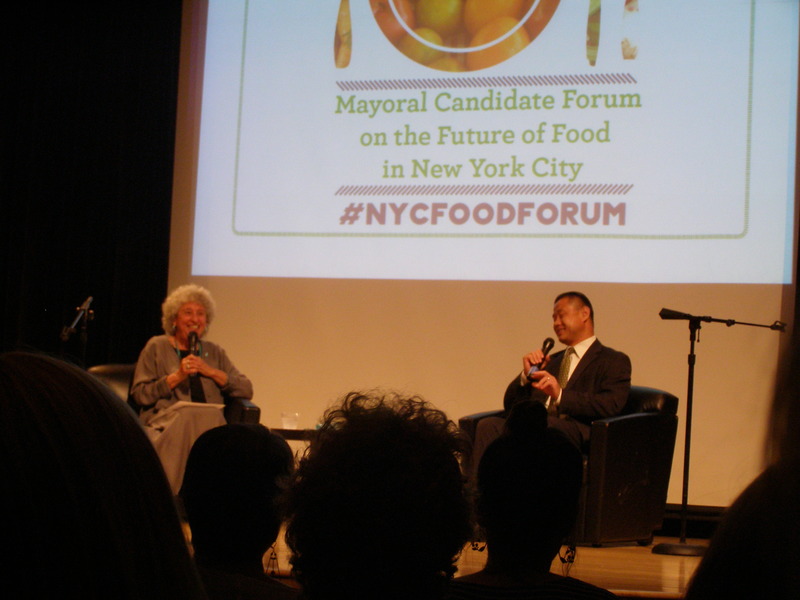 In one-on-one interviews with blogger, author and New York University professor Marion Nestle, mayoral contenders addressed issues that ranged from hunger and school lunches to living wages for food workers, urban agriculture and the Hunts Point market. The event drew some 1,000 food policy enthusiasts and mayoral candidates Sal Albanese, Bill De Blasio, John Catsimatidis, John Liu, Christine Quinn and Anthony Weiner. Bill Thompson was the only mayoral candidate who did not attend. The fact that nearly all of the mayoral contenders participated was a coup for the city’s food policy thinkers and activists, Nestle remarked as the crowd awaited the arrival of Quinn and Liu. It’s the first real example of the political clout that food policy experts are beginning to gain, she said, after years struggling to correct flaws in the nation’s food system. Each of the candidates answered three questions from a list of about 10 questions that Nestle had on hand. They also answered a question from the audience. Here are snippets of some of the more interesting things the candidates said regarding their views on local food and urban agriculture. Both Albanese and Liu said they would make information about vacant land more transparent. As Albanese put it, he would make sure the city’s 5,000 acres of empty land “is on the computer.” Even more important, he said he would not accept contributions from developers, saying that community gardens “add food, awesome quality of life and environmental soundness to neighborhoods.” He also said that that he would work to both grow and preserve gardens. Bill De Blasio and John Catsimatidis both seemed to be on board with increasing the amount of local food available in New York City. Both want to bring in more local food through the Hunts Point market in the Bronx. “I want to reorient over time to more local produce from our broader tri-state area as part of our overall effort to wean us off the culture of produce from 3,000 miles away,” De Blasio said of his vision for Hunts Point. Catsimatidis also said that he wanted to expand and get better road access for the market. Liu noted that he would “grow the food economy,” saying that he supports rooftop gardens, upstate farmers and the expansion of farmers markets. 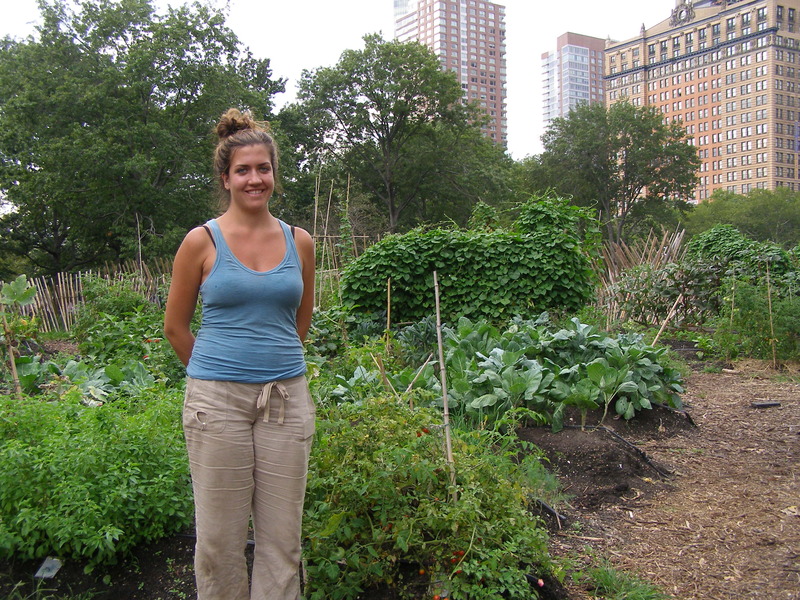 Quinn, long a champion of local food and overall food policy issues, noted her work on a comprehensive report released in 2010 that analyzed the city’s food system from farm to table and beyond. During the forum, she emphasized the need to capitalize on the city’s purchasing power to reorient buying toward regional and local produce. It’s the second biggest institutional food purchaser, second only to the U.S. military, she said. De Blasio had similar views with regard to the city’s purchasing clout. “I think we can focus our city power on the produce from our region and work with other cities to do the same,” he said. Caption for photo above: Columbia University’s Marion Nestle (left) speaks with mayoral candidate John Liu. © Photo by Margarida Correia. See caption at bottom of post. The temporary one-acre urban farm that opened in April at the Battery is not so temporary anymore. It will shift to a new location in the park when a planned bike path comes through in 2012, said Warrie Price, founder of the Battery Conservancy, a non-profit dedicated to revitalizing the Battery at the tip of Manhattan. “It’s been too much of a great positive thing for the neighborhood and for us as an organization,” she said as she made her rounds amid rows of tomatoes, peppers, eggplants, beans and a riot of other crops on Saturday. Since it opened, the farm has received a great deal of media attention with Inhabitat New York City naming it one of the city’s top five urban farms. 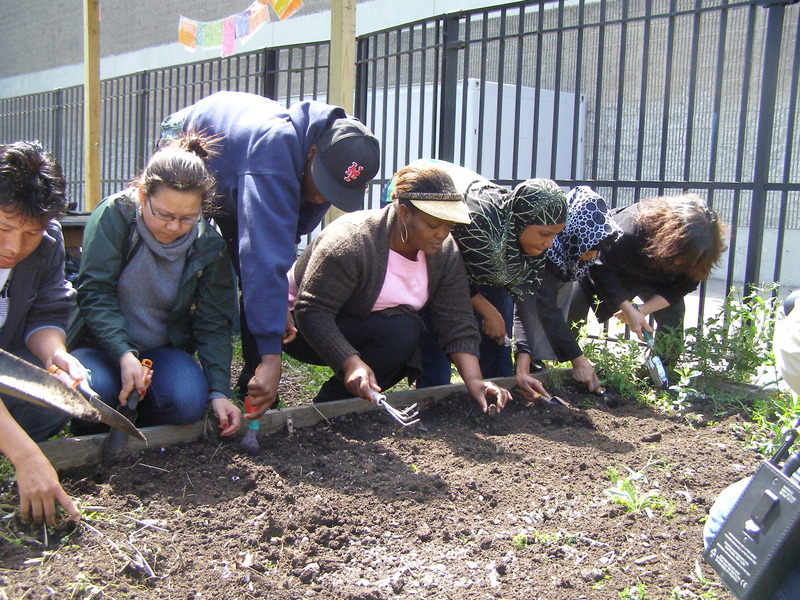 It’s been a hit with neighborhood school children, Lower Manhattan residents and local community groups who “adopted” or planted half of the 100-plus vegetable beds. It also drew hundreds of volunteers eager to help the Battery run the operation. A clutch of enthusiastic gardeners — trowels and soil scrapers in hand — readied for the special planting that was about to take place at Drew Gardens in the West Farms neighborhood of the Bronx. One by one, they squatted by the side of a just-tilled garden bed and began to tuck peanuts into the ground. Angel Valeri Nogue beamed. The peanuts, she blurted with pride, were “brought here to New York” from her grandmother’s plantation in West Cameroon. “I used to stay on my grandmother’s plantation in the springtime for six months to help,” said Nogue, a refugee with the International Rescue Committee, a nonprofit organization that helps resettle refugees, asylees and victims of human trafficking. New Yorkers showed overwhelming support for two food-related bills at a public hearing convened last month by the New York City Council Governmental Affairs Division. The proposed bills back recommendations in a plan to revamp the city’s food system and make local and regional food more available to New Yorkers. The plan was outlined in an 86-page report, FoodWorks, released by NYC Council Speaker Christine Quinn last year. Urban farming has grown so much in New York City it’s produced an offshoot — one that needs buildings, rather than soil, to grow food. But is high-tech, high-rise farming in keeping with the values of traditional urban farmers who like dirt? Is it sustainable, and can it produce food that people can afford? Urban street trees tend to die young, but with a little TLC from committed volunteer stewards they can live much longer. 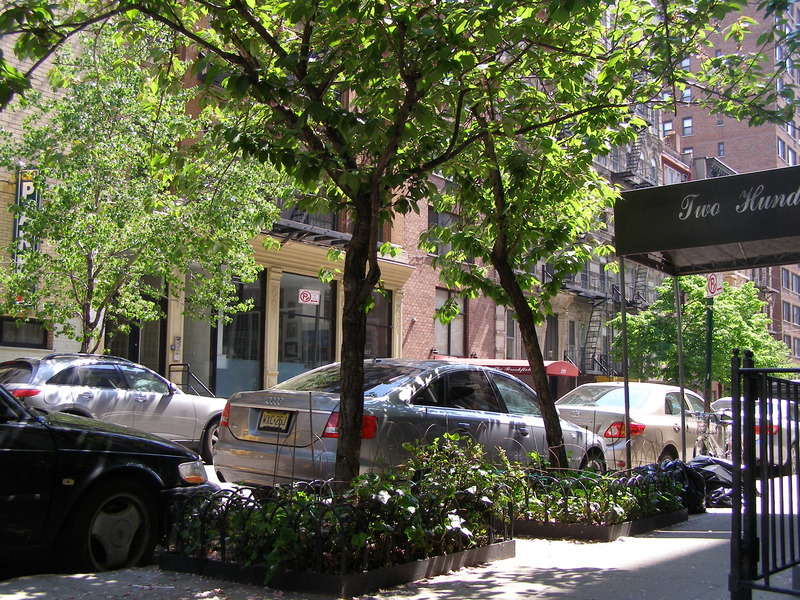 That’s the major finding of a five-year study conducted by Steven Boyce, an urban tree enthusiast in New York City.